Athachamayam at Tripunithara near Kochi (Ernakulam) in Kerala on Atham Nakshatram (asterism) in Malayalam Chingam Month announces the arrival of the Onam festival. The Athachamayam festival 2018 at Tripunithara is on August 15. There is a famous saying in Kerala – Atham Pathinu Ponnonam - the tenth day from Atham Nakshatram day is Thiruonam. The history of Athachamayam is traced back to the reign of the Maharaja of the erstwhile Cochin State. It marked the journey of the King, with his followers, from Tripunithura to the Thrikkakara Vamana temple for participating in the Onam festival. The main highlight of the Athachamayam festival is a colorful procession – exhibiting the rich cultural tradition of Kerala. The glittering procession includes caparisoned elephants, color floats and tableau displaying episodes from Hindu Puranas, epics and also those having social message. Numerous Athapookalam, or floral carpets, a major highlight of Onam festival is displayed during Athachamayam. Kerala is home to numerous traditional art forms and majority of them will be on display during the Athachamayam procession. 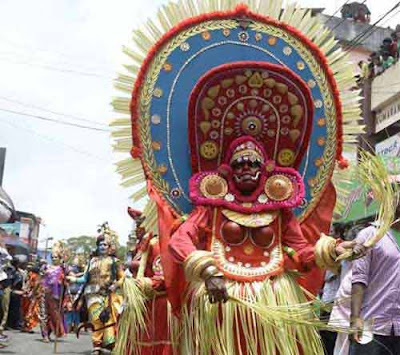 Theyyam, Kummatikali, Kavadi, Thiruvathirakali, Kathakali, Karakattam, Mayilattom, Ammankudam, Aattakavadi and Pulikali are some of the traditional art forms that are usually part of the processions. Traditional Kerala music like Panchavadyam, Chendamelam etc provide music to the Athachamayam procession.